The HS2 RP 4300K 1-Light Kit from Cineo Lighting builds on the foundation of their popular HS fixture offering cross-compatibility with all legacy HS and LS fixtures, accessories, phosphor panels, and cabling. 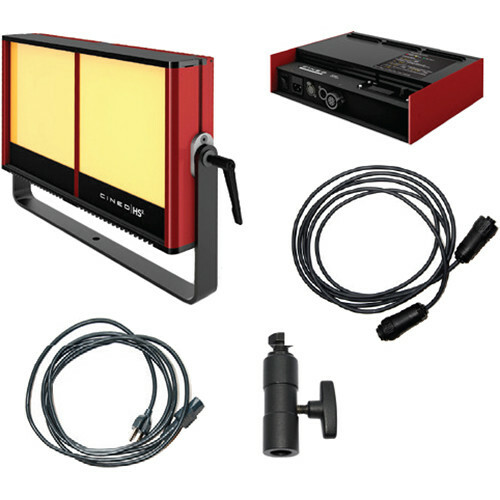 The kit includes an HS2 RP lamphead, yoke, TVMP stand adapter, 4300K panel set, locking AC power cord, and a 10' lamphead cable that allows you to keep the power supply separate from the fixture. Color fidelity is the prime mover in the design of the HS2. Two distinct mixing chambers allow custom color mixing while the use of Remote Phosphor Technology permits high CRI and TCLI ratings of 97 and 98. A top-hinged access panel makes it easy to swap out any of the light's optional RPI panels from 2700 to 6500K. Accurate control is also extended to the light intensity which is variable from 0-100% free of flicker either locally or via DMX. There's also fine-tuning of dimming available via DMX. The HS2's multi-voltage power supply has been redesigned and reduced in size and weight while its digital display has been made even more user-friendly. It can be attached modular-style with optional rails or used remotely up to 300' from the lamphead.